This is a great opportunity for Cub Scouts to complete their requirements and experience the outdoor adventure of the new Mays Family Scout Ranch. The new Cub Scout requirements activity will cost $15. Please provide a packed lunch on the day of the event. All Scouts who register for the rank requirements must be within the correct Cub Scout rank to proceed and complete the new requirements. Only 24 Scouts can register for each session. **For some events there are multiple sessions offered. You only need to attend one session to complete the activity. Rolling Tigers (Tiger Rank): Rolling Tigers is a Tiger Elective Adventure for Cub Scouts to learn about bicycling. Scouts will learn how to wear proper safety gear, learn safety rules on a bike, and safety hand signals. This adventure will demonstrate safety tips to follow when riding your bicycle. All scouts must bring their own bicycle, helmet, Tiger handbook, and a pencil. Sky is the Limit (Tiger Rank): Sky is the Limit is a Tiger Elective Adventure for Cub Scouts to go outside and observe the night sky. Scouts will look at distant objects through a telescope and learn about constellations. Learning about stars, astronauts, and our solar system will make for an enjoyable evening. All Scouts must bring their handbook and something to write with. Air of the Wolf (Wolf Rank): Air of the Wolf is a Wolf Elective Adventure for Cub Scouts where Scouts learn about activities using air; such as paper airplanes, balloons, music, kites, and more. Scouts will conduct an investigation about the weight of air and air temperature. All Scouts must bring their handbook and something to write with. Please bring a packed lunch and a bottle of water to this adventure. Paws on the Path (Wolf Rank): Paws on the Path is a Wolf Required Adventure for Cub Scouts to prepare for a mile hike. Scouts will learn how to plan out a hike, learn what to do if separated from their group, and improve their hiking skills. Scouts will prepare to hike safely by gathering the Cub Scout Six Essentials to take along on their hike. All Scouts must bring their handbook, reusable water bottle, and something to write with. 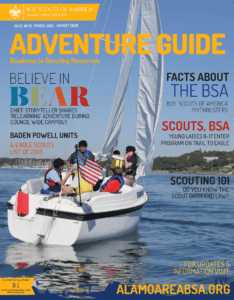 Super Science (Bear Rank): Super Science is a Bear Elective Adventure for Cub Scouts that involve simple science investigations with static electricity, buoyancy, and color. Scouts will also conduct a color-morphing investigation and color-layering investigation. All Scouts must bring their handbook and something to write with. Baloo the Builder (Bear Rank): Baloo the Builder is a Bear Elective Adventure for Cub Scouts to learn about tools and build a wooden project. Scouts discover which hand tools are the best ones to have in your toolbox. Scouts also learn the rules for using tools safely. Practice with at least four tools before beginning a project. All Scouts must bring their handbook and something to write with. Into the Woods (Webelos Rank): Into the Woods is a Webelos Elective Adventure for Cub Scouts to learn all about trees and plants in their local environment. Scouts develop a plan to care for and then plant at least one plant or tree. They will learn about how a plant helps the environment and its many uses. All Scouts must bring their handbook and something to write with. Art Explosion (Webelos Rank): Art Explosion is a Webelos Elective Adventure for Cub Scouts to learn about all types of art. These include drawing, painting, sculpture, origami, digital art, graphic design, photography, comics, and more. Scouts will then create two self-portraits using different techniques, as well as complete two other artistic activities of their choice. All Scouts must bring their handbook and something to write with.